For the longest while, I’ve been wanting to get into a good fantasy series. After reading The Song of Ice and Fire, The Kingkiller Chronicles and The Lord of the Rings, I’ve got standards about the sort of epic, adventure fantasy that I wanted, yet I did not want to rush straight into one that focusses around high fantasy, wars and bloody conflict. I mean, not yet anyway. I wanted to go down the route of fantastical beasts, gentle adventures and a discovery of the protagonist’s strengths through their narrative. 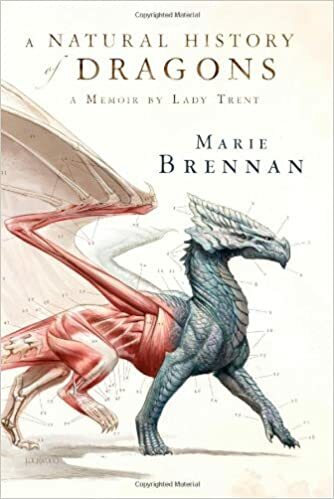 So, after being drawn in by the gorgeous covers, and the fact that it was a memoir by a female protagonist, Marie Brennan’s novel series From the Memoirs of Lady Trent. This series, despite not being finished yet, as so far not disappointed about easing me into the world of the fantasy novel. d values are the preferred norms for young ladies, Isabelle risks her reputations, her prospects, and her even her life in the pursuit of turning her passions into a real vocation. And from marriage, kidnapping, dragon attacks and exciting journeys in different terrains, Isabella gets her first taste into the life that she would eventually turn into a lifelong career. In the first book, The Natural History of Dragons, the reader first gets introduces to Isabella as a young girl who gets her first taste of an obsession with dragons from discovering a dead sparkling, a supposedly insect that resembles a dragon. And from this, her obsession grows. However, the society in which Isabella was raised in, shows great displeasure over women educating themselves about science and adventuring, and she is forced into adapting into becoming more ladylike. Yet after a period of this forced behaviour, Isabella meets her future husband Jacob, and together they get involved with Lord Hilford, who organises a trip to the mountainous region of Vystrana, and Isabella gets her first taste of working in a region that is not only swarming with dragons, but also different religions, customs and battles against keeping dragons alive, and not turning them into a profit. And whilst on this expedition, Isabella encounters smuggling, death, exploitation of bones and a dragon graveyard, which not only changes how the world sees the beasts, but how they are seen to treat each other. In The Tropic of Serpents, Isabella enlists the help of a runaway heiress, the once standoffish scientist, Tom Wilker, and goes on another expedition to the place known as the ‘Green Hell’ – a tropical and deadly rainforest where she wants to discover the secrets of the elusive swampwyrms, and their breeding patterns. But like in all Isabella’s travels, there are political and religious strife that halt her progress, and whilst in the ‘Green Hell’ she becomes close to the people of the area, called the Moulish, and through them she learns the secrets of the area, the creatures and the war that is ranging between the locals and invaders. Isabella also grows in confidence over her ability in being a dragon naturalist, and she moves further away from her upbringing as a potential lady of social graces, and further into the realm of the scientific. 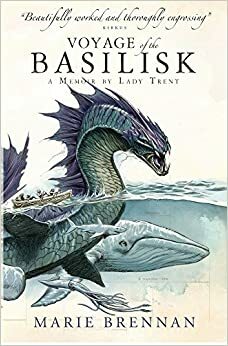 And finally, in Voyage of the Basilisk, Isabella is once again on her adventures, but this time, she has enlisted the services of the Royal Survey Ship, ‘The Basilisk’ for an ambitious, two-year trip around the world to study all different sorts of dragons in their natural habitats. And this time, she’s not alone. Accompanied by her seven-year old son, his governess, Thomas Wilker and the hilariously motel crew, headed by the crazy Captain Aekinitos, Isabella once again has to deal with all sort of issues that delay her expedition, such as shipwrecks, sea battles and an attack by an angry sea-serpent, but that’s not all. Isabella has to also deal with issues without her personal life, with conflict with her young son, the attention of a chivalrous, foreign archaeologist, and the gossip that is spreading around her home country about her love life. With the character of Isabella/Trent, Brennan’s novels are written in a first-persona narration style, and therefore she introduces herself as Lady Trent, and states that in her younger years, she was significantly different from what she is now. In fact, frequently through the texts, Trent reminds the reader that she was young, naive and inexperienced, and her actions may appear so foolhardy to readers, and even embarrassing towards herself. By Brennan giving two different versions of herself, she makes the reader interested in not only the past version, but the future version, therefore hints towards a slow character development in subsequent books. Brennan also writes the style of a memoir extremely well. By not including anything that Trent would consider to be rambling or insignificant, she sticks with facts and opinions that she wishes to divulge, and doesn’t want to give any details about the expeditions that she thinks the reader would know about, or wouldn’t care. 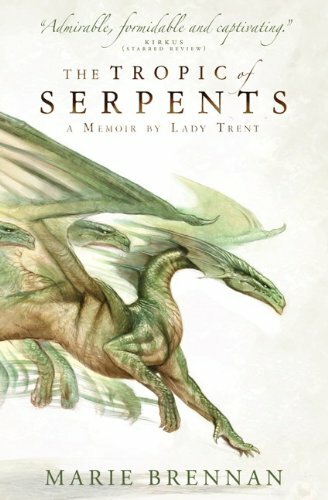 Now, I realise that this is a fictional account, and Trent isn’t a well-known dragon specialist, but in the way that Brennan writes is incredibly realistic, and sticks to the idea of a memoir being something that she has written and edited. I particularly liked when Trent was addressing her editor whilst writing. This is a subtle hint that Brennan has added in, and it shows that Trent, as an older woman, has developed something of a backbone. As a younger woman, Isabella had to deal with growing up as the only daughter of a titled family, and therefore had to go through all the stigmas that come with it. Brennan really highlights the idea of a society that still have the social norms as chaperons, young women being used as bartering chips for a good marriage, and the idea of young girls being educated not to be adventurous. One of the parts that I found intriguing in the book is when a young Isabella tries to force herself to be more ladylike. She calls this her ‘Grey Years’, and it really shows how much she was forced into adapting a way of life that wasn’t natural to her. And when she couldn’t adapt, this also highlighted the fact that Brennan has made her into a flawed person, and not too unrealistic. The rest of the characters could have done with a bit more exploring. Some of them felt flat, and despite being relatively important to the entire story arc, they didn’t live up to what they could have been. Jacob, for instance, is the love interest in the book, and despite this romance being nothing that is clichéd and the relationship between him and Isabella seems well-suited, he just doesn’t get enough of a background, or towards the end of the first book, him and the others just seem to peter out. But, later on, Brennan writes some characters that really flourish. Natalie – the runaway heiress, is a young woman who could easily be Trent’s protegé, and I enjoyed how Brennan wrote her to be like a high-class woman who, like Isabella, didn’t want to follow society’s expectations of her. She is courageous, and what I found very interesting, was the fact that she deals with her sexuality in a frank and honest way. Another character who I enjoyed was Tom Wilker. He first of all started as a standoffish and aloof character who butted heads with Isabella, but as the novels progress, he gets fonder of her, and there is an underlying, romantic tension there that has not been resolved by the latest book. Wilker and Isabella are very similar personalities, so it is possible that Brennan wrote him to be her eventually romantic conquest, but also as an equal to her. I love a good bit of world-building in with my fantasy, and this is something that Brennan hasn’t disappointed with. With the customs of Scirland, and Lady Trent, Brennan has clearly drawn on Victorian England, yet she’s written fantastical elements in with it. Dragons are just another type of wild animal that need to be scientifically explored, and not beasts from a fantasy novel, she’s imagined different countries with their own religions and customs, that get ignored by the foreigners. Brennan also got the Victorian idea of foreign travel being a new and interesting concept to the world of Scirland – (their version of England). There’s also a lot of Russian influences with the names and the religious structures which I enjoyed discovering. Now, in my opinion, the first 2/3 of the first book follows an interesting and page-turning set of events, as we get Isabella growing up, going through her Grey Years and then going on her first adventure. However, the last third ultimately disappoints as the storyline became blurred, dry to the point that I had to go back to previous chapters to remind myself of past events, and with a clumsy use of red herrings, the novel just didn’t finish in a particularly neat way. And unfortunately, this pattern is similar in the rest of the novels. The first few sections are interesting, but when it gets into the politics and the worlds, I do find myself drifting slightly. But it may not just be Brennan’s writing, but my own attention span. But, overall, I enjoyed these novels. They were light, a good introduction to an easy, and particularly not violent fantasy novel, but did have a slight dip in interest towards the end. I will be reading any following books, as the characterisation and growth of Lady Trent interests me, and I want to see exactly when she becomes Lady Trent, and when she becomes the brave, dragon expert that the world is familiar with. Author’s website – Click Here.